Domaine de Vertmarines villa park offers 4 types of detached villas. The interior is comfortable and pleasant. There is a living room with a seating area and sliding doors to the patio. Fully-fitted open-plan kitchen. Your private swimming pool is in the enclosed garden with garden furniture. In cooler months, the swimming pool can be heated for a surcharge. You have access to a garage. There is a washing machine at your disposal. Detached villa (FR-85160-17) for 4 people. There are 2 bedrooms. Each bedroom has a double bed or 2 single beds. There's a bathroom with a bath or shower. There's a separate toilet. 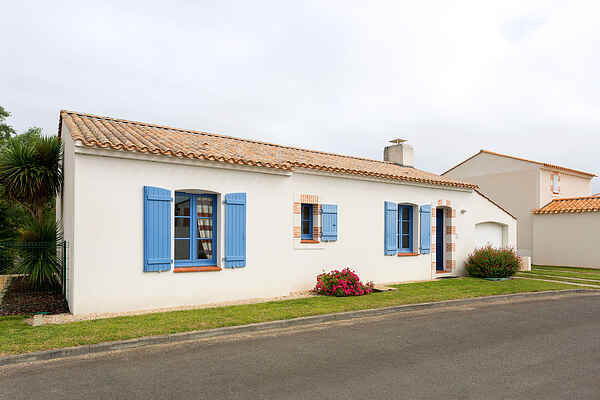 Detached villa (FR-85160-18) for 6 people. There are 3 bedrooms. Each bedroom has a double bed or 2 single beds. Sometimes there is a bedroom upstairs. There's a bathroom with a bath or shower. There's a separate toilet. Most villas have a second bathroom with a bath or shower. Detached villa (FR-85160-19) for 8 people. There are 4 bedrooms. Each bedroom has a double bed or 2 single beds. One or more bedrooms are upstairs. There's a bathroom with a bath or shower. There's a separate toilet. There's a second bathroom with a shower and second toilet. Very luxurious detached villa (FR-85160-20) for 8 people. This villa type is identical to the FR-85160-19, only furnished more comfortably and in an optimal location. The living room, kitchen and garden are larger and equipped with more facilities. There are 4 bedrooms. Each bedroom has a double bed or 2 single beds. One or more bedrooms are upstairs. There's a bathroom with a bath or shower. There's a separate toilet. There's a second bathroom with a shower and second toilet.